- In 2006, James Hall (owner of Ashton Granite) began learning the trade of granite fabrication. His first position was a “helper” in an established business. Although, the lowest man on the “totem pole”, he was positioned for success; he would learn the trade from the ground up. - The company he contracted with changed their platform of doing business. This left James with two options: 1) find another trade or 2) start his own granite business. In 2007, He chose to start Ashton Granite Design, LLC. It was a very humble beginning; with one helper and a 400 square foot shop. The next four years would be the test of his dream. James learned to operate his business by trial and error and many failures. He made the errors and failures his stepping stones for growing in knowledge and skill. - In mid-2010, business began to improve and by 2011, James had two helpers and needed a larger facility for fabrication. The next four years were still trying but James was overcoming the obstacles and seeing his dream rapidly become reality. As time progressed He gained favor with wholesalers, suppliers, builders, and some home owners. By the close of 2014, Ashton Granite Design, LLC, was solid in business and referrals were consistent. - Business was evolving and Ashton Granite Design was no longer a meager fabrication shop. With five employees, repeat business, and the need for administrative help, James had to make a major move. In mid-2015, He moved the business to a 6,000 square foot facility; adding office space, a showroom, and a larger fabrication shop. In addition to hiring an office manager, he hired two more employees. - Today, with 10 employees, Ashton Granite Design, LLC has sustained even more growth and is becoming well-established in the Tulsa community. We are blessed, blessed, blessed!!! I want you to know how much I love our new countertops. They are perfect! Thank you for taking the time to make it exactly what we wanted, helping me make decisions & doing it all with such excellence. You were all so amazing to work with! 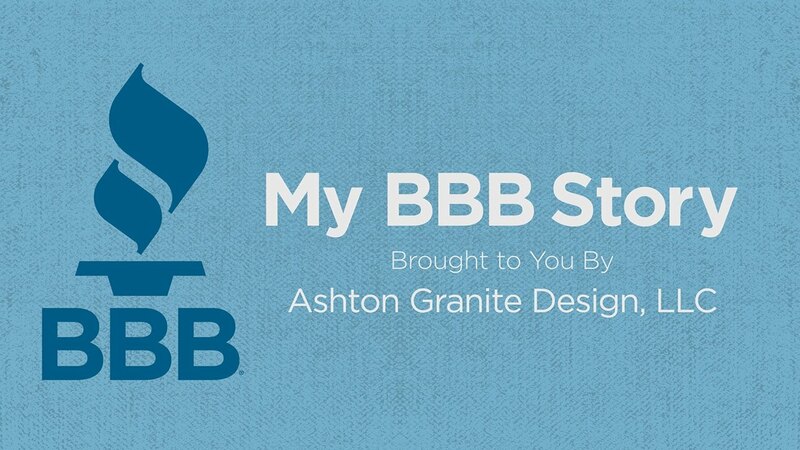 Ashton Granite is a BBB Accredited business. Hear more of their story!